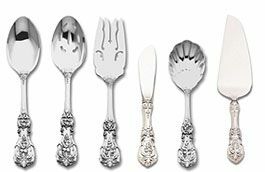 What is sterling silver flatware? Sometimes you'll see on older pieces the mark "925"
What kind of pieces do I need? Mostly, you need place settings and serving pieces. Probably between 4 and 12 place settings. Which serving pieces are up to you, depending on the foods you like to serve. 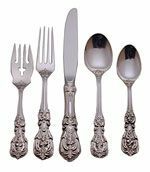 Piece number 5 in the "5-piece Place Setting" is the soup spoon next to the knife. How do I know what pattern to pick? How do I keep this stuff clean? Is it a pain to polish it? That wasn't so bad, was it? If you have any questions, we're always happy to answer them for you.